Texture, color and inspiration at the CHA winter show. 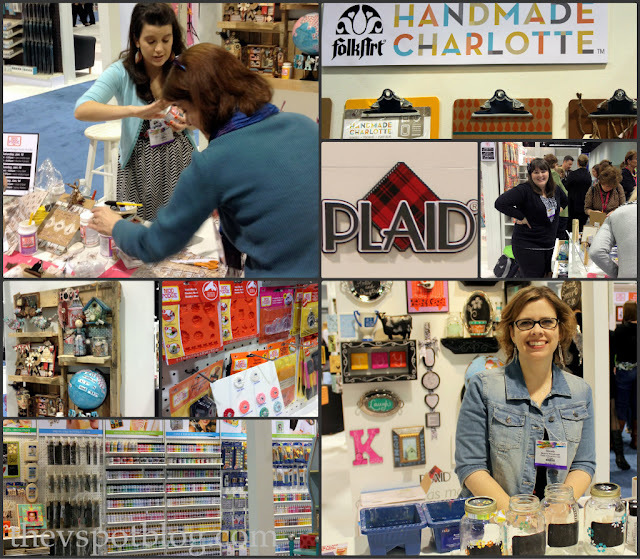 Remember last week when I told you about the Top 5 craft products that I (personally) was all excited about after the CHA (Craft & Hobby Association’s) Winter Trade Show? Well, I had also been feeling a smidge a wee bit kind of fairly uninspired as of late. (Yesterday I shared the AWFUL areas I need to work on at home.) I had high hopes of soaking up a little inspiration at the show. We all get into ruts. I think even super-duper-crafty-Olympic-sized creative types get into little funks. If they say they don’t, they’re lying. I was excited to see the products that are coming on the market, but I was also so happy to see all sorts of colors, textures and people. I thought I’d share some of the images from the show. 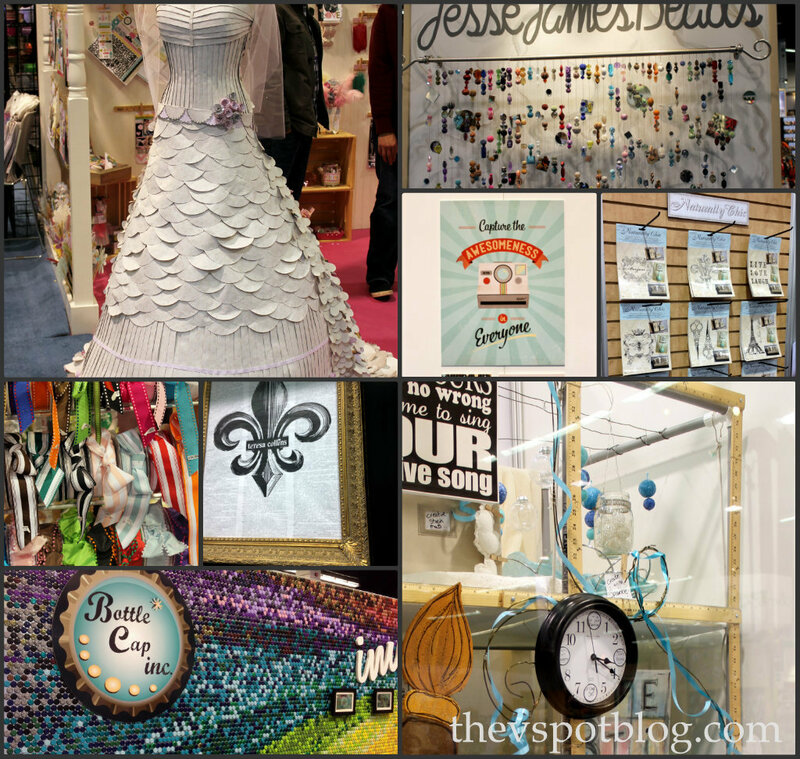 I was thrilled that my Personalized Wine Charms made Plaid’s Blogger Project Wall. I was in awe of the company I was in. Katie from Sweet Rose Studio, Beckie from Infarrantly Creative and Heather from Dollar Store Crafts. CHA isn’t open to the public, so I was very fortunate that Plaid Crafts invited me along and asked me to demonstrate how I make my Faux Robin Eggs for a video tutorial. 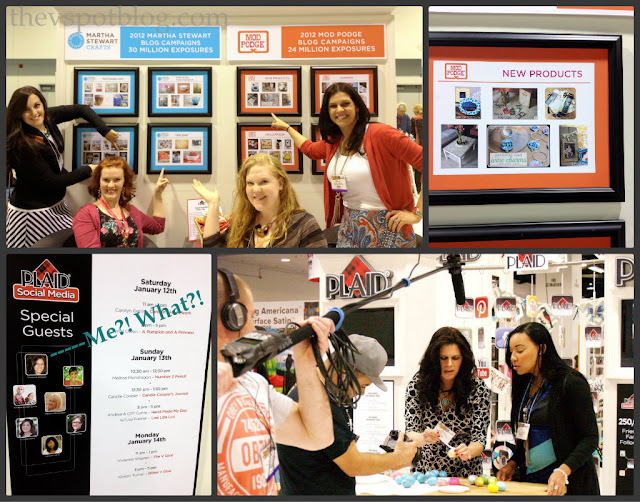 Plaid was awesome to work with and I’m excited about several of the new products! There were also some amazingly artistic people there. I was thrilled to spend a little time with them. They are creative inspirations and just flat out really nice people. You might recognize a lot of faces: Melissa from Number 2 Pencil; Katie from Sweet Rose Studio; Sara from Mom Endeavors; Amy from Positively Splendid; Jen from Tatertots & Jello; Amy from Living Locurto; Karen from The Graphics Fairy; Tauni from The SNAP Conference; Mique from Thirty Handmade Days and The Queen Bee Market; Heather from Dollar Store Crafts; Angie from Country Chic Cottage; and Bev from Flamingo Toes. (I love hanging out with Bev. One of the nicest people ever!) 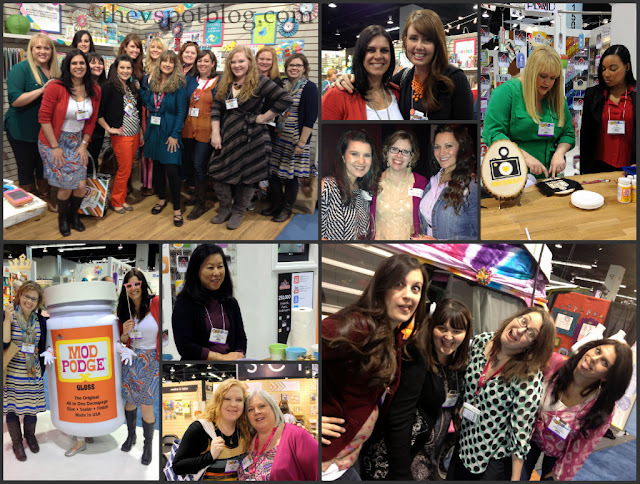 I also was so pleased to meet Jade from JaderBomb; Carolyn from Homework, and Vicki from The Creative Goddess. Whenever I get to see Alexa from I Love To Create and The Swell Life, it is a fun time. She be crazy. The displays and booths provided lots of inspiration, whether it was the products themselves or the displays created to showcase them, I snapped lots of photos. Here are some shots of what struck my fancy. Texture and color and paper and fun products! I’m really gravitating toward texture right now. 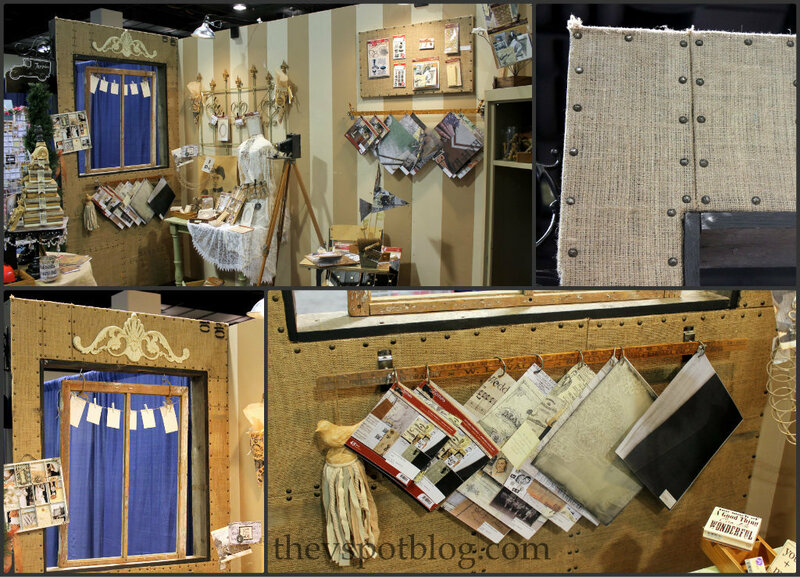 I was particularly inspired by the displays and products in the Canvas Corp booth. I noticed a lot of yardsticks and tape measures used in displays throughout the show. Not normally my style, so I’m not sure why they are calling my name… That’s where the creativity comes in. Questions for myself: What do I like about those yardsticks? The look? The unexpected way it’s being used? The color? The rusticity? Then, (important) how can I use it in a project that works for me and my style? That answer probably won’t come overnight. It will float around in my head and pop up unexpectedly for some other application. There is nothing wrong with seeing something you like and making one of your own. (Always give credit where credit is due, of course!) The very process of making something will spark your creativity a little bit more. Feel free to let the things that inspire you just sit in your head for a while. Let them marinate. Let it happen naturally and put your own twist on things. If they could bottle creativity, then we might not appreciate those creative moments when the come around. Be sure to appreciate your creativity. What inspires you today? Check out other CHA round ups at Craft Test Dummies. Great post Vic, and it was fun to put faces/names to so many bloggers! You make a very important point when talking about seeing all those yardsticks at CHA. Rather than just jumping on the yardstick craze, consider why you’re drawn to it, if it will work for you, and how to incorporate it into your own style. Bravo for a valuable mini-lesson! Thanks! Thanks for posting this. We hope you had fun in our booth. So nice to meet you. Oooh…CHA looks like it was so much fun. What an absolutely incredible, inspiring opportunity! Make an easy Yarn Tree… in less than 5 minutes. Black & White Pumpkin Topiaries: another DIY Halloween craft.